Two days ago, on June 30, 2014, I again visited my surgeon’s office and finally received the outside part of my implant. 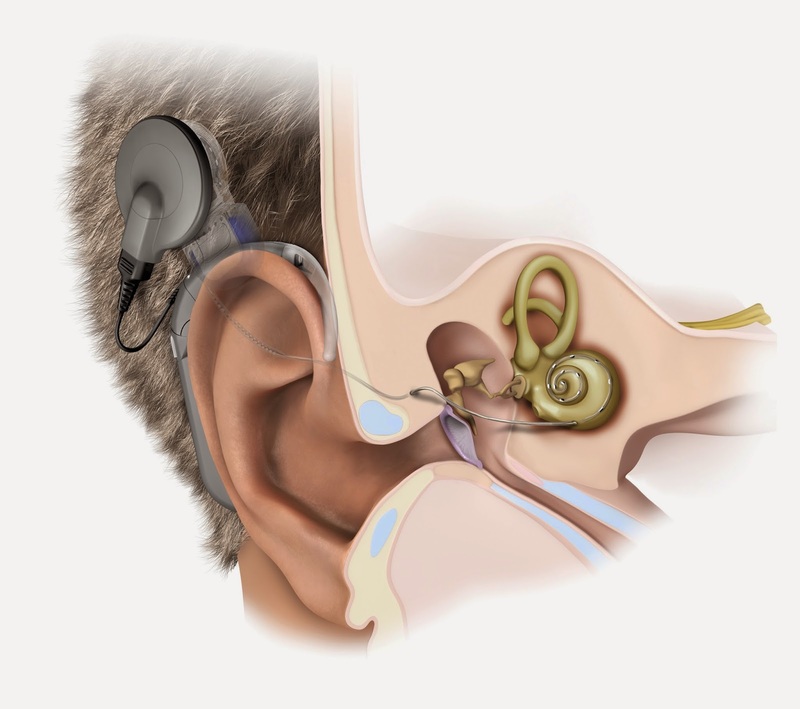 This event is normally referred to as “Activation.” It is the moment when the external electronics (the processor) are added to the internal implant and the electrodes which were implanted deep in my inner ear. Despite my repeated warnings that there would be a long learning curve, I think that some people still expected my hearing to miraculously return to normal. I knew that wasn’t going to happen, and it didn’t. Even so, the chief audiologist (who was in charge of the activation) felt that it went quite well. During the activation, the electrodes (there are twelve) were turned on, one at a time, making a tone that increased in volume. While it did so, I was to point to a chart that indicated my perception of the loudness until it reached a point where it was uncomfortably loud. That happened eleven times but on one of the electrodes, no matter what “volume” it was at, it felt uncomfortable. It was strange. While it did not “sound” loud, I could still “feel” the volume as if I was listening to a bass drum and could feel the “thump.” According to the audiologist, eleven out of twelve was very good as some people can only discern the levels of volume on a handful of electrodes the first time. After all of the testing, and programming was done, we spent over an hour going over all of the accessories and attachments that come with the implant. I had heard others with a cochlear implant talk about “the briefcase” that they received at activation, and discovered that “briefcase” is not a metaphor or an exaggeration. I received a real, physical briefcase that was full of spare parts, batteries, wires, and other things as well as an entire shopping bag full of other pieces and parts. I also have a thick stack of instruction manuals that I am supposed to read over. Despite spending considerable time going over this with the audiologist, I will be spending a fair amount of time looking over all of these things again and figuring out how and when to use them. For now, as my brain reorients itself to this new way of hearing, the world sounds strange. I have heard the words “robotic” and Electronic” used to describe it and those certainly apply. Sometimes people around me (and my own voice) sound like they’ve been sucking helium or are imitating Mickey Mouse. It’s weird. The good news is, even though the world doesn’t sound like it’s supposed to sound, I canhear things that I haven’t heard in years. When we came out of the doctor’s office and started the car, it beeped to remind us to fasten our seat belts and I heard it. I had no idea that our car made that noise and had never heard it before. I can hear my phone ring, and water running in the sink, and the click of my computer mouse and I haven’t heard those things in a long time. Yesterday, as I went out to retrieve the newspaper, I might even have heard a bird sing, though I’m not sure because it sounded weird. As expected, I received a list of exercises that I need to do as “physical therapy.” I am to take my hearing aid out and, hearing only with my implant, say the alphabet out loud, or count out loud. I am to have my family read children’s books to me as I read the words so that my brain can begin to relearn what the sounds are. My cousin, who also has a cochlear implant, said that “weird” will last for a while but my audiologist told me that in six months they hoped that I would be able to hear (understand) as well as I could before my surgery. After that, they said that I could expect continuing improvement for up to a year, and possibly even two years. I knew before we started that this is not a quick fix and, while in some ways things are already better, I know that this journey is going to take a while.